Given its compound ranking of 92%, we conclude that the Margaritaville Bahamas is, as of now, Alphachooser's best Margaritaville blender 2019. Alphachooser also concludes that our sample of 307 reviews from our sources gives us a high confidence level (more on confidence levels) that prompts us to name it a "no-brainer best choice." With its 4.5 stars averaged from 261 reviews, here is second best Margaritaville blender. * This choice (and the following members of this best models list), is based on a full analysis of hundreds of reviews from across the web. A blender good for margaritas and other frozen drinks with a self-dispense lever, a 60-ounce capacity, and an Auto-refresh setting that does a quick blend before dispensing a frozen drink. 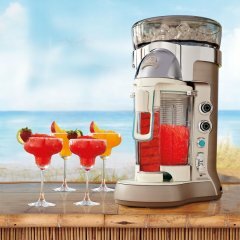 A 54-ounce margarita blender with toggles for automatic shave-and-blend and manual shave and blend, as well as an ice proportion selector. An automatic cordless battery-operated margarita blender with an ice proportion dial. A cordless margarita blender that has a shave-and-blend technology and can be operated either automatically or manually. 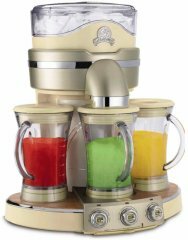 A margarita blender with a rotating ice chute and both automatic and manual shaving and blending features for three separate blending stations that each have six pre-programmed drink settings. A margarita blender with an automatic shave-and-blend system and a tank that collects melted ice, with the addition of an ice selector dial. A margarita blender with an automatic shave-and-blend feature and a manual switch for shaving and blending, as well as an ice selector dial.